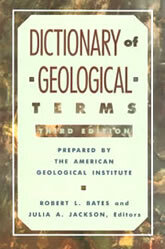 The American Geological Institute's Dictionary of Geological Terms, Third Edition, edited by Robert L. Bates and Julia A. Jackson. Definitions for over 5000 geological terms, including word origin and pronunciation guide for many of those terms. Includes a geologic time scale and development of life chart. A 5 1/4" x 8" paperback with 572 pages. If you are a geology student, geologist, or a person interested in learning about the Earth, a geological dictionary can be a very useful addition to your desk or library. When reading about scientific subjects, you will frequently encounter words that you would like to understand or like to understand better. The quickest route to that knowledge is a comprehensive and reliable dictionary. Every time you use the dictionary to learn about a word, your knowledge will increase. You will become familiar with that word and be able to appreciate it the next time you encounter it. There is nothing wrong with looking up the same word twice, three times, or more. Each time you do that, your understanding of the word deepens. There is a distinct difference between knowledge and understanding. Using a dictionary not only helps your reading comprehension, it also helps you better convey your ideas and knowledge to other people when speaking or writing. Communication skills are essential for all scientists, and being able to use the language of your discipline properly and effectively is a pathway to success. There is a wise saying among geologists that "the best geologists are the ones that have seen the most rocks." But, before you can understand what you see and have the ability to convey your ideas properly, you must first be able to use the language of geology.